When not working on Star Wars, Bad Robot has been creating a new sport which can be played within Team Fortress 2. Valve and Star Wars studio Bad Robot have been on friendly terms for a few years, which is why that Super 8 interactive trailer ended up in Portal 2. But now the partnership has created something far more interesting: A new Team Fortress 2 game mode. Designed by Bad Robot and co-developed by Escalation Studios, PASS Time is a fast-paced sport where each team tries to steal the ball and score goals under heavy fire. And what's more, you can play the beta right now within Team Fortress 2. 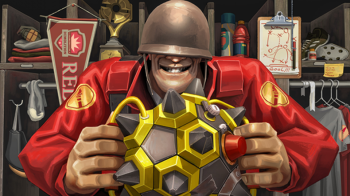 PASS Time centers on the "jack", a ball which any player can pick up but also replaces their weapon. That means you're depending on your team to cover you while escorting the jack to a goal zone. At any point, you can pass the jack to another player, but have to be coordinated enough that the enemy doesn't intercept it at the worst time. Carrying the jack has some benefits - health regenerates, speed increases, you gain temporary invulnerability upon stealing or intercepting, and you can see teammates and opponents across the map. PASS Time also introduces speed boosts and jump pads to keep the action fast-paced. Oh, and if a match ends in a tie? Now you've entered a literal Sudden Death mode to determine the winner. Team Fortress 2 has been getting regular updates like this since 2007, and it's promising to see Valve still has no intention of slowing down. You can play PASS Time today by loading up the beta maps in-game.